José Aldo and Renato Moicano will square off in the co-main event of the evenings. Needless to say, the winner of this fight has the inside track for an early title shot this year. 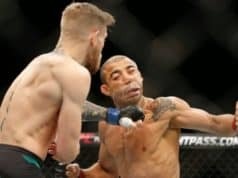 While it seems Aldo should easily be 35 or 36 years old with all his experience, in fact, the former featherweight champ is only 32 years old. That is only three years older than Moicano. Aldo most recently defeated Jeremy Stephens at UFC on FOX 30 last July. Moicano holds a record of 13-1-1. His only blemish is to former title challenger Brian Ortega. Having beaten Cub Swanson at UFC 227 his last time out, a win over Aldo should solidify his position at the top of the division. The fighters touch gloves. Moicano takes center Octagon. Both men taking their time to start seemingly sizing each other up. Aldo pumps the jab as Moicano throws a spinning back kick that misses. Aldo throws a big overhand right hand that misses. Aldo lands a leg kick followed by a left hand. Moicano answers with a leg kick of his own. Again both men taking their time in their movements early on. Moicano throws a lazy head kick that just misses the mark. Moicano throws a one-two combo. Aldo whiffs a leg kick. The fighters briefly engage in a firefight with Moicano getting the better. Moicano circles right and lands a left. The round ends. The second frame starts with Moicano taking center Octagon again. Aldo lands a big left hand that hurts Moicano, he rushes in and lands another left hand. He follows it up with a right to the body and a knee. He blasts him with an uppercut and a right hand. Moicano is down. The fight is over.